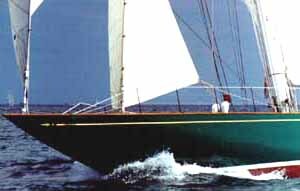 Between 1930 and 1939 the America's Cup races in Newport were sailed on enormous J-class boats. Sir Thomas Lipton (Lipton Tea) built Shamrock in 1930 as one of the first of the J-class boats and she was one of the best floating sights in Newport Harbor. 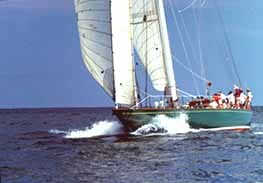 Shamrock was owned by Newport's International Yacht Restoration School (IYRS) headquartered right on the Thames St. waterfront, but now Shamrock is privately owned and rarely seen in Newport. The racing sloop was restored and modernized and the new owners are revamping it. On the water there is absolutely nothing to match the sight of Shamrock. The flag at the top of the mast is 160 ft. above the water (about the height of a 16-story office building). The hull is wood and the length is 120 ft. overall. When the wind is just right, the sails move the 146 ton sloop up to 12.5 knots. 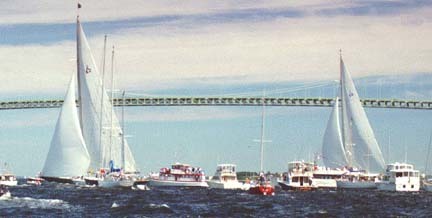 Endeavor, the only other active J-class sloop to visit Newport, sometimes match races with Shamrock in front of a large spectator fleet. Everyone tries to stay out of their way. Shamrock is in front.